The UFC heads to Russia for the first time with UFC Moscow, and Cageside Press has their picks set for the Saturday afternoon card. The main event of UFC Moscow features fan-favorite Mark Hunt against submission specialist Alexey Oliynyk. Hunt still has some fight left in him, defeating Derrick Lewis in 2017 and nearly scoring a knockout against top young heavyweight Curtis Blaydes in his most recent appearances. The 44-year-old is 8-6-1 with one no contest in the Octagon, with seven knockouts. Oliynyk joined the UFC when he was already 51-9-1 and is 5-2 in the Octagon. The Russian has an incredible 46 submissions on his resume. Hunt was unanimously picked by the staff. The co-main event features the return of Nikita Krylov to the UFC. Krylov was 6-3 in the Octagon, finishing all of his victories, then he signed with Fight Nights Global of his native Russia. Since then, he is 4-0, all stoppages, and won the organization’s light heavyweight title. 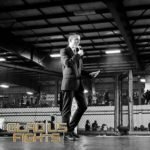 He will face Jan Blachowicz in the co-main, who is the fourth-ranked 205-pound fighter in the promotion. After starting his run with the UFC at 2-4, Blachowicz has won three straight, including a fight of the night victory over Jimi Manuwa. The staff unanimously picked Krylov. Andrei Arlovski looks to get back in the win column against Shamil Abdurakhimov. 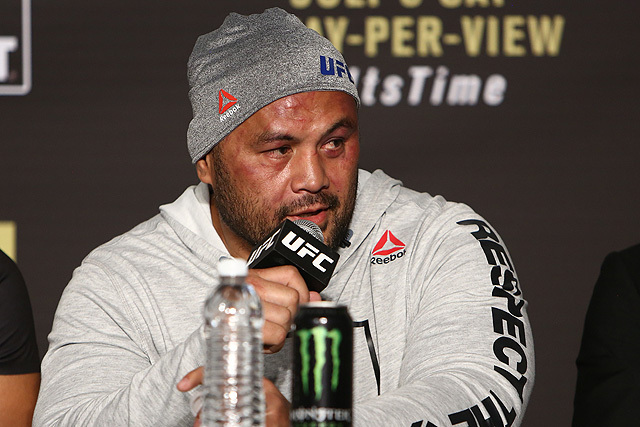 Arlovski stopped his five-fight losing streak with a pair of wins over Stefan Struve and Junior Albini, but fell to Tai Tuivasa in his last appearance. Abdurakhimov is 3-2 in the Octagon, rebounding from a loss to Derrick Lewis with a first-round knockout of Chase Sherman. All but two writers selected the former champion Arlovski. Opening up the UFC Moscow main card is promotional newcomer Alexey Kunchenko and former title challenger Thiago Alves. Kunchenko is 18-0 with 14 stoppages in his career, and has defended the M-1 Global welterweight title four times. 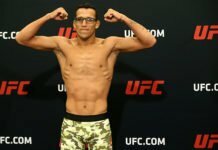 Alves is 1-1 since returning to welterweight after an attempt to drop to lightweight, defeating Patrick Cote and suffering a brutal knockout at the hands of Curtis Millender. Kunchenko was picked by all but one writer.